Welcome to our inaugural newsletter! If you would like to offer us feedback or contribute submissions to future newsletters, please contact us. Warm wishes to NOW members in this New Year of 2019! For our chapter, it is a great time. Our board has grown, and we have so many volunteers I am having a hard time getting to know all of them! I can feel people coming out of the woodwork to add their voices and actions…. In these times of increasing neo-fascism in our government and our country, and the escalating damage to our planet home, it is essential that empowered people come together and insist on a civilized and sustainable society. We will have to work to preserve the limited safety, equity, and reproductive rights that have been secured for our more privileged women. And we will have to work hard in new intersectional coalitions to extend these gains to ALL women and ensure that they do not get eroded. We can each do something. Some people write letters. Some demonstrate. Some visit their elected officials or run for office. Some change laws. Some throw parties! There is room for everyone, and we are much stronger together. Come to our mid-month member meetings and see what you can do. At the very least you will enjoy the company of wonderful activated women. I feel the sap rising! 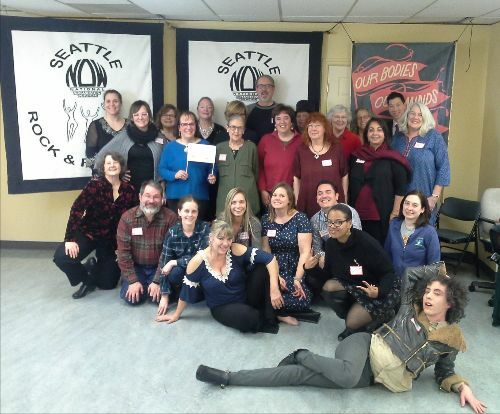 We recently held our Annual Meeting Thursday, December 13th; bringing together an amazing and inspiring group to celebrate Seattle NOW’s past accomplishments, discuss further issues and plan for the upcoming year! The evening kicked off with a social hour where guests in attendance enjoyed hors d’oeuvres, courtesy of PCC Community Markets, wine, a photo booth and connecting with fellow feminists. Seattle NOW President Kjersten Gmeiner took to the podium to welcome everyone and share the mission and goals of the organization, along with Treasurer Dennis Barnes who went over our many endeavors and feats from throughout the year. Guest speakers from the Trust Women Foundation, Chief Operating Officer Molly Oakley and Development Director Rebecca Tong, gave a brief and informative presentation about the efforts of their organization in which they advocate for and offer services regarding women’s access to reproductive rights. After a short break and couple rounds of feminist trivia, Linda Tosti-Lane went over the legislative initiatives for the upcoming year, followed by the board election and meeting. Two new members, Lisa Weber and Monica Chilton, were elected to the board, in addition to two new appointments. Board member Rachel Wilka was elected as Vice President as well as Tiffany Wilk for Secretary. Women’s leadership is needed now more than ever. 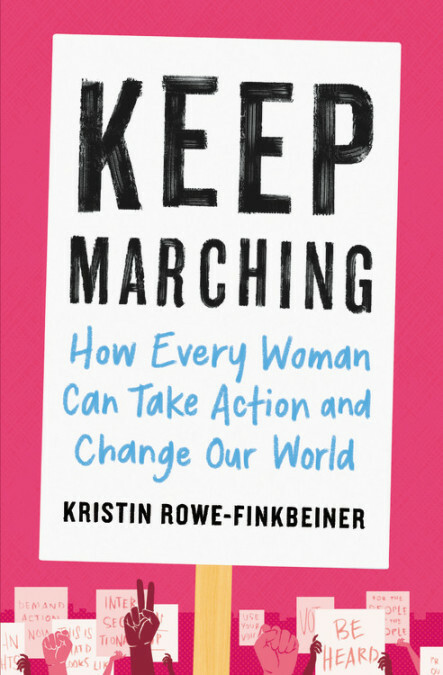 Join us at the member meeting on February 20th to discuss the book and how to keep the movement going! 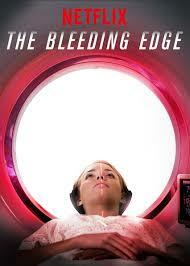 We’re planning a screening of this movie about the dangers of medical implants. More details will be posted soon. 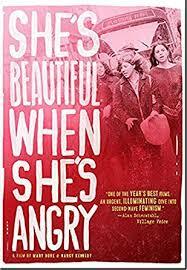 Seattle NOW and PLU’s Political Science Department recently screened this wonderful film on the history of modern feminism. Join us at our first monthly membership meeting of 2019! Ring in the new year by making signs for the upcoming Womxn’s March and receiving important legislative training. Come together for a weekend of building power through community and activism. The Womxn’s March will commence from Cal Anderson Park at 9 a.m. on January 19th. Workshops will be offered at the Seattle Center after the march and in hubs throughout the city on January 20th. March again on January 21st to celebrate MLK, Jr. and to call for an end to racism, injustice and poverty. Visit the websites of Seattle Womxn Marching Forward and Seattle MLK Jr. Organizing Coalition for more event details. Check out our website often to see more upcoming events! In the 2018 legislative session, the Reproductive Parity Act (RPA) was passed ensuring that insurance companies provide birth control coverage without co-pays, and requiring private insurance companies that provide coverage for maternity care to also cover abortion care. This bill is critical to guarantee coverage for contraceptive and abortion care, regardless of what happens to the federal Affordable Care Act. But the RPA leaves out many in our state who do not have coverage through private insurers. DACA recipients, undocumented women and other immigrants under the federally mandated five-year bar need additional protections in the law to fill the gaps in their coverage. It is also critical to address the reproductive health needs of transgender Washingtonians. The barriers to accessing health care for the transgender community is a result of the systemic discriminatory practices by healthcare organizations who refuse to provide services to transgender people. Studies since 2011 reveal that 19% of transgender people are refused medical treatment and for people of color, the percentage is higher. There is also verbal harassment that occurs in many medical facilities. Discrimination by healthcare providers results in postponing healthcare, which results in preventable health problems. To learn more about reproductive justice in the transgender community, read Lawyering for Reproductive Justice: Reproductive Justice in the Transgender Community: If/When/How Issue Brief. Because the Trump Administration is hell bent on rolling back the basic human rights afforded to immigrants and the transgender population by the Obama Administration, it is imperative to contact all State Senators and Representatives asking them to support the Reproductive Access for All Act. We are looking for a very part-time website administrator to build and maintain our website. This position is key to keeping our members and prospective members up-to-date on key information and events. The work should take around 5-10 hours per month. For more details regarding this or other volunteer opportunities visit our website or contact us! When was your organization founded and how did it come to be? 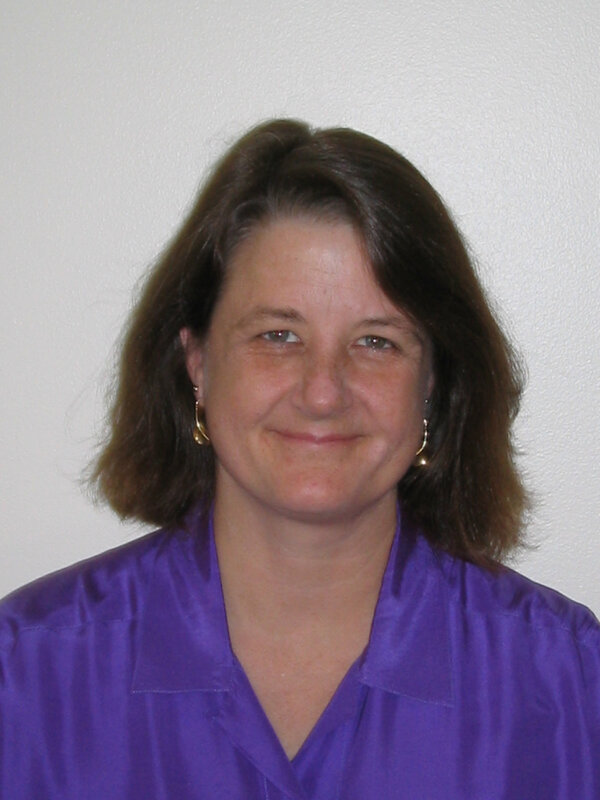 Trust Women was founded by Julie Burkhart in 2009 in Wichita, Kansas after the assassination of her boss and mentor, Dr. George Tiller. For over 30 years he kept the doors of his clinic open despite constant harassment and threats on his life. Originally, Ms. Burkhart intended to just continue the political and advocacy work they had been doing together under ProKanDo, the political action committee they built together. However, it became clear that you can have the best legal protections, but if there is nowhere for women to actually go, then the right to an abortion is just a theory. So, in late 2010, Ms. Burkhart made the decision to open a clinic in Wichita; at the time it was the largest metro area without an abortion provider. Now, Trust Women has clinics in Wichita, Oklahoma City, and Seattle. What pressing women’s issues does your organization address and why are those issues important to you? We believe that women deserve access to reproductive health care regardless of where they live or their ability to pay. A portion of our work is to ensure that those without the ability to pay, still receive reproductive health care. In Kansas and Oklahoma, private and publicly funded insurance is barred from covering abortion care, unless women purchase a separate “rider policy.” Trust Women helped hundreds of patients last year, coordinating $308,000 from a dozen abortion funds, including our own in-house fund. We simply don’t want money to be the reason why a women does or does not get an abortion. In addition to direct patient care, we also do a great deal of advocacy, lobbying and communications work. We want to actively change the policies and laws we are forced to operate under. These laws are not based in science or facts and these policies actually lead to worse health care outcomes. Finally, Trust Women is litigating to expand access to reproductive health care. In Kansas, we have filed suit challenging the Kansas Telemedicine Act, which sought to ban abortion administered through telemedicine (this was targeting medication abortion procedures). This ban singles out abortion care. Before introducing telemedicine in our Wichita clinic, we were only able to offer abortions two days a week. We are now able to offer medication abortion services on additional weekdays and on Saturdays. We are looking forward to expanding this program even more using remote sites and mobile health units. What policies do you think are needed at the state and local level to address women’s reproductive rights? Any policy that ostracizes abortion care or abortion providers not only makes accessing care more difficult, it also further ostracizes and stigmatizes patients and providers. Washington State and activists like Seattle NOW’s members, have made sure that reproductive rights and health are protected in Washington state. What are some of your organization’s recent accomplishments that you are most proud of? In addition to providing access to abortion care at some of the only clinics in Oklahoma and Kansas, we are also working to move the conversation on abortion by mobilizing and identifying pro-choice individuals in these states through our canvassing program. We engage with voters at their doors to ask them to take action to support abortion access. This past election cycle, we talked to voters we had identified through previous canvasses to get out the vote. This helped lead to the election of more pro-choice lawmakers, including Laura Kelly as Kansas governor. We have conducted pilot programs in both our Kansas and Oklahoma clinics to make long acting reversible contraceptives (LARCS) such as IUDs and implants accessible to low-income patients that don’t have insurance coverage. Also, we are suing the state of Kansas to allow us to continue using telemedicine in our Wichita clinic to provide medication abortion. We are pioneering the use of telemedicine to provide medication abortion in new areas. This allows us to provide services in more locations on more days, allowing us to better serve patients. We are also excited to have recently opened a clinic in Seattle, Washington. What are the most important goals that lie ahead for your organization? Expanding access through telemedicine and litigation, offering care up to the legal limit and stopping the weaponization of religious liberty. What are some everyday things that Seattle NOW members can do to support your organization and the women you serve? Speak about abortion care as part of reproductive health care. Help raise the profile of Trust Women by following us on Facebook and Twitter and sharing the work we do with your online and in-person networks of family and friends. Host us for a speaking engagement. Contribute monthly, it helps us plan ahead and keeps our costs low. Refer patients to us for primary or abortion care. What words of encouragement do you have for our sisters struggling with these issues? Dr. Tiller wore a blue button on his shirt every day. It said, “Trust Women.” We take our name, our mission and our unceasing drive for justice, from this. For almost 40 years, before anti-choice extremists took his life, Dr. Tiller kept the doors of his clinic open in the face of harassment and terrorism. We must do no less for women today.